In this project, I am going to Interface an Alcohol Sensor with Arduino. Here I have designed an Arduino Shield PCB using EASYEDA online PCB simulator and designer. Arduino Alcohol Detector will detect the alcohol level in breath and by using some calculations in code we can calculate the alcohol level in breath or blood and can trigger some alarm. In this Arduino Alcohol Detector Shield we have used a MQ3 sensor to detect present alcohol level in the breath. 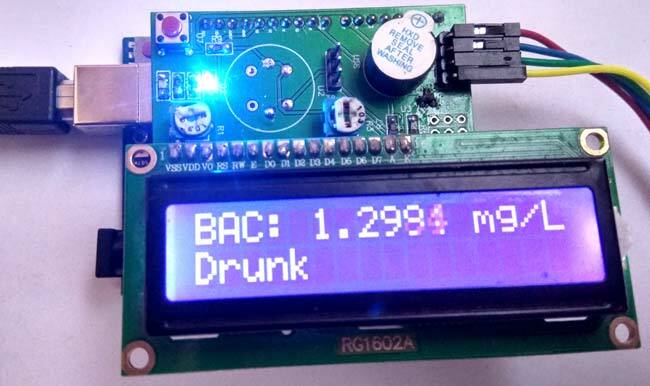 A 16x2 LCD is used for displaying the PPM Value of alcohol. And an LM358 IC for converting alcohol level sensor output to digital (this function is optional). A buzzer is also place for indicating high alcohol level. Circuit Diagram for this Arduino Alcohol Sensor Project is given above. We have a comparator circuit for comparing output voltage of Alcohol Sensor with preset voltage (output connected at pin D7). Alcohol sensor output is also connected at an analog pin of Arduino (A0). Buzzer is connected at Pin D9. And LCD connections are same as Arduino LCD examples that are available in Arduino IDE (12, 11, 5, 4, 3, 2). A push button also used here for start taking reading from Alcohol Sensor connected at digital pin D6 of Arduino. Remaining connections are shown in the circuit diagram. Note: In the circuit, we need to short all the three pin of J2 header to calculate PPM. For designing Alcohol Detector Shield for Arduino we have used EasyEDA, in which first we have designed a Schematic and then converted that into the PCB layout by Auto Routing feature of EasyEDA. Complete Process is explained below. According to MQ3 datasheet, alcohol in clean air is 0.04 mg/L. So we power the circuit and find the output voltage of MQ3 sensor in room air (I assume my room has clean air) so I got 0.60 voltage. It means when the sensor is giving 0.60v in the clean air then alcohol will be 0.04 mg/L. Alcohol = 0.67 * v .
Where v is the output voltage of alcohol sensor. Note: This calculation is not accurate or standard. Now we know the least driving limit while drinking alcohol is around 0.5mg/L. But in our calculation, we are getting around 0.40 mg/L in clean air so that we have set a threshold of alcohol while driving 0.80mg/L (just for Demonstration). MQ3 alcohol gas sensor is made by using SnO2 material which has less conductivity in clean air. Whenever it comes nearby alcohol gas its starts conducting highly according to the gas concentration. So user can sense the difference of output voltage using any microcontroller and can detect the presence of Alcohol. This is low cost and a suitable sensor for many applications for alcohol detection. This sensor has a long life and good sensitivity. Some of the applications that can be made by using this sensor are Alcohol gas alarm, portable alcohol detector, gas alarms, Breathalyzer etc. To design this Arduino Alcohol Project Circuit, we have chosen the online EDA tool called EasyEDA. I have previously used EasyEDA many times and found it very convenient to use since it has a good collection of footprints and its open-source. Check here our all the PCB projects. After designing the PCB, we can order the PCB samples by their low cost PCB fabrication services. They also offer component sourcing service where they have a large stock of electronic components and users can order their required components along with the PCB order. After completing the design of this Arduino Alcohol Project PCB, you can order the PCB through JLCPCB.com. To order the PCB from JLCPCB, you need Gerber File. To download Gerber files of your PCB just click the Fabrication Output button in EasyEDA editor page, then download from the EasyEDA PCB order page. Now we just need to attach LCD to the Shield and place this Alcohol Detector Shield over the Arduino. Align the Pins of this Shield with the Arduino and firmly press it over the Arduino. Now just upload the code to the Arduino and power on the circuit and you are done! Your Alcohol Detector is ready to test. What is the shipping cost in jlcpcb.com? Very nice article about alcohol detector. I will try in my home. What is the use of IC LM358 in this circuit?